The three principal texts of this chapter are connected in their preoccupation with ‘mimicry’ and its role, paradoxically, in both the maintenance and the secret subversion of authority. In each of these texts, these two principal preoccupations are closely interleaved because in each history is read through the interconnection of power, mimicry, authority and subversion. 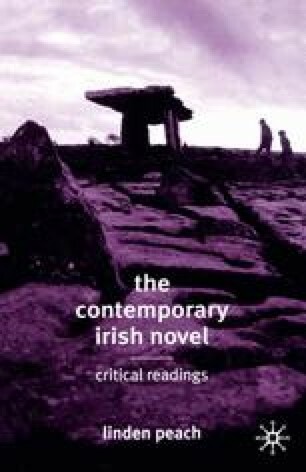 Homi Bhabha (1983) offers perspectives on the relationship between mimicry, power and authority in a colonial context which are applicable to Moore’s The Magician’s Wife, which is specifically concerned with France’s colonization of Algeria, to Donoghue’s account of women’s lives in the eighteenth century and McGahern’s covert critique of the Irish state in Amongst Women. Although Bhabha writes primarily with the colonial and postcolonial experience in mind, the relationship between power and mimicry is one that enters more generally into contexts that are dependent upon the maintenance of dominant and subordinate relations. Bhabha’s essay is dependent upon another influential postcolonial theorist Edward Said, whose recognition that mimicry is an ironic, secretive interface between the dominant presence, and its panoptical vision of identity and status, and the changing perspectives of, and sense of difference among, those who are dominated.